The Tiftickjian Difference - Tiftickjian Law Firm, P.C. We appreciate that you are taking the time to visit Tiftickjian Law Firm online. 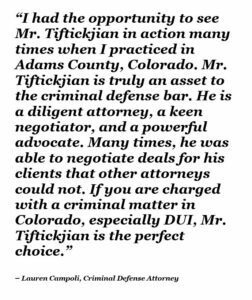 There are many factors that potential clients consider when choosing a DUI attorney in Colorado, so we wish to highlight The Tiftickjian Difference and what a client can expect upon retaining our services. We are confident that after doing your due diligence, you will come to the same conclusion that many other people have – Tiftickjian Law Firm is your best choice for representation if your primary objective is to get representation that is well-respected, ethical, approachable, and that has the ability to get the best results with the least amount of stress and anxiety to you. It is critical to do your due diligence if you want your side to be presented to the prosecutor by someone they respect, and if you want to appear in front of the judge with well-respected counsel next to you. Your decisions and actions post-arrest can have a great impact in the ultimate result of your case, and your choice of attorney will be the first decision that the judge and prosecutor will see you make moving forward. When doing your research online, you will see countless attorneys claim they are the “best” and “most experienced,” and promise to “aggressively defend” you and to “fight” for you and your case. You likely also sifted through some sharp-looking websites with numerous badges and logos claiming awards, “Top 10″ lists and “best” awards from various associations, and read countless glowing reviews boasting about the miraculous results the attorney achieves for every single client. Unfortunately, some of the glowing reviews you may have read across the internet for some law firms are a sham. Some testimonials are paid for, and some written by family members, friends, neighbors, reputation management services, or other lawyers from different states on a “you-scratch my back, I’ll scratch yours” basis. This occurs in all occupations and industries, but especially from lawyers looking to take short cuts to present best to potential clients who have just faced a life-altering arrest and are in dire need of help. What is also not disclosed is that many of these awards and badges you may have seen on other lawyer websites are meaningless, paid-for endorsements that are offered to anyone willing to pay for them. We receive consistent spam from fly-by-night companies claiming our lawyers have been selected for inclusion on a “top 10” list for a cost of, for example, $500 annually. Tiftickjian Law Firm is listed in Best Law Firms, Best Lawyers, Bar Register of Preeminent Lawyers, and Super Lawyers. All of these are strictly peer-reviewed by our colleagues in court and the judges that we appear in front of. None of these are paid-for accolades for the firm or any of our attorneys. If you do your research in the Colorado legal field and online, you will see over a decade of legitimate, consistent, positive feedback about Jay Tiftickjian and the attorneys at Tiftickjian Law Firm. 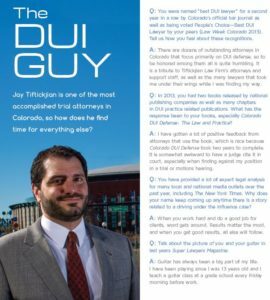 Firm owner Jay Tiftickjian is the President of the Colorado Criminal Defense Bar, and has been voted “Best DUI Lawyer” in the state’s official bar journal, Law Week Colorado, seven years in a row. 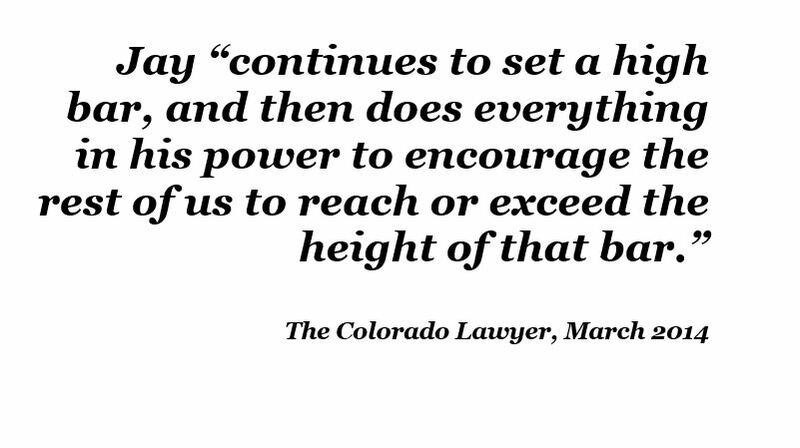 He has literally written the book on Colorado DUI defense that all of the attorneys you are likely researching use in their practice, and has chaired annual DUI seminars for attorneys and judges with the Colorado Bar Association and Colorado Criminal Defense Bar. 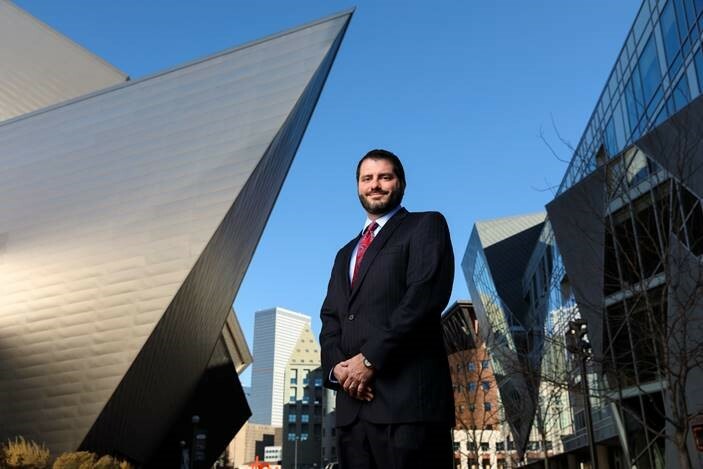 Tiftickjian has presented across the country for other state bar associations and the National College for DUI Defense, and he is considered Colorado’s “go-to” authority on DUI law. For a full list of Mr. Tiftickjian’s professional achievements and credentials, visit his profile page located here. Many law firms will tell you they specialize in DUI defense, but they also “specialize” in general criminal defense, family law, personal injury, and any other area of law in which they can turn a profit. We are not a general criminal practice that handles a little bit of everything. We are a boutique specialty practice that makes DUI defense well over 85% of our practice area. We have a team of attorneys that each have their own area of expertise and specific role in the defense of your case. For example, firm partner James Nechleba is a former administrative law judge for the Colorado DMV, and has been asked multiple times to present at seminars for bar associations on the topic of DMV Hearings and DUI driver’s license revocations. Doug Barnes’ experience as an appellate attorney is second to none. Mr. Barnes has over 30 years of trial and appellate experience, and is a key contributor to the legal research and motions litigation at the firm. All of the attorneys at Tiftickjian Law Firm have specialized training in criminal defense, DUI, DMV, and drug law and extensive experience litigating cases in court. 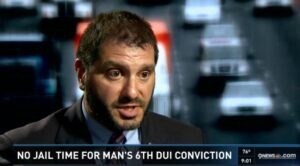 If you watch, read, or listen to local news, you likely have seen, heard or read Mr. Tiftickjian’s expert legal opinion when it comes to DUI and drug law issues. 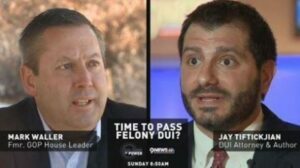 He has provided expert analysis to The New York Times, Associated Press, Denver Post, and 9News, to name a few, and has debated government and law enforcement leaders on issues related to DUI. He is also the voice of the criminal defense bar as its president. Mr Tiftickjian has testified in the legislature on legal issues such as felony DUI. For example, Mr. Tiftickjian debated Denver District Attorney Beth McCann on Colorado Public Radio about felony DUI law, and argued with Former GOP House Leader Mark Waller regarding felony DUI on 9News’ Balance of Power. To watch Mr. Tiftickjian on television or read his expert commentary in newspapers across the country, check out our firm press page. When important issues arise that affect all people in Colorado, it is common to see Tiftickjian at the forefront of the issue. For all of the reasons above, Tiftickjian Law Firm is your best choice when seeking experienced counsel for a Colorado DUI charge. If you want the most well respected and accomplished representation for the best result possible, call us today or contact us through this website to speak with Mr. Tiftickjian or one of our DUI defense attorneys.